Eau de New York was released by Bond no. 9 in 2004. The fragrance was created by nose Vera Vanore of Robertet, and features notes of grapefruit, mandarin, bergamot, petit grain, fresh greens, neroli, gardenia, cyclamen, white lily, basil, verbena, jasmine, vetiver, oakmoss, skin musk, and white wood. Eau de New York starts with a blast of zingy citrus overlaid with green notes. The citrus notes last well into the dry down, which is largely fresh, transparent florals with lots of neroli and an herbal undertone from the basil. The base is musky and mossy without being particularly earthy; the wood notes are very light. It is a unisex scent, and more dry than sweet. As befits the signature scent of New York City, it is vibrant and alive, perhaps even a bit brash. It is sometimes compared to Annick Goutal's Eau d' Hadrien, but to my nose it is a considerably heavier and more complicated fragrance. That may or may not be a good thing, depending on your outlook, but it does have much greater lasting power (easily 6-8 hours or more on my skin), and unlike many citrus based fragrances, it stays crisp and fresh straight through to the end. 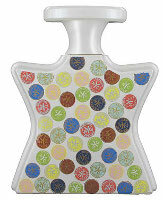 Eau de New York is one of my favorites from this line, and the bottle is stunning: pearlized milk glass decorated with multi-colored subway tokens. The picture does not do it justice. A 50 ml bottle is $110, 100 ml is $198. For buying information, see the listing for Bond no. 9 under Perfume Houses. On the strip, neroli was the most obvious note to me, but I still have to try it on my skin, but I agree with you in that the presentation is striking. Thank you for a lovely review! I just tested this after reading your review (from a bunch of bond samples some friends kindly sent me). I like it – it is quite perfect for today as we are enjoying some gorgeous warmish days – well till we get rain in a day or so. Great review R and I love the bottle. V, the neroli is very pronounced, but I do get lots of basil as well. Hello N, the bottle is really so much more striking in person — the finish is very luminous and in the picture you can hardly tell that the design is subway tokens. Very cool! Precious, I love the bottle…I love you…but the Bonds fail to move me! LOL! When it doesn't work, R, it doesn't work and there is nothing you can do! Hey, did you try the Iris Silver Mist yet? I dabbed a little bit on my left wrist last week. At first, I was not impressed. It smelled like dry roots, as iris often does. Later on, I noticed a beautiful fragrance wafting about me. It was not the Hiris that I was wearing on the rest of my body. No! It was the SIM! I plan to wear it all over once the weather gets cooler. Big hugs on this one, darling! I am so glad you like it R! We all need another SL lemming from the “exclusive” line, LOL! The Eau de New York is more of a summer scent, but I really like my citrus in the winter when I need cheering. Thanks for this review, R! I am enjoying this Bond series. I am sure that is no surprise to anyone. This bottle is so dear because it's the design that covers the BondMobile! I would love to have a bottle of Eau De New York for the humid heat of Ohio summers. P, I haven't seen the Bondmobile but now I will have to look for a picture, I didn't realize it was decorated like the bottles. Too cute! LMAO @ “*faints*”! I’m cracking up so hard at that! Looks like I’ve cut my list down. Thank goodness for samples! I don’t want Scent of Peace, Coney Island, Astor Place, Bleecker Street, and I really don’t need union square. Guess what I won on Ebay :). Eau de New york! (79.99 for the 3.3 in the box!) I also won a brand new Lexington Avenue! So, that’s 3 Bonds! You’re doing great on ebay, congrats!